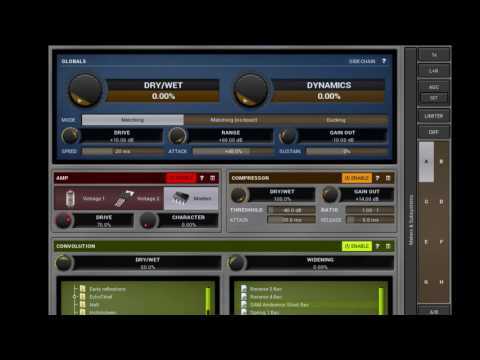 MPhatik is a unique dynamic multi-effect featuring an amp, convolution and a compressor, which lets you warm up your audio and then restore the original dynamics. And that's just the beginning without even starting to get creative. Amping/distortion/saturation are the classic methods for adding some warmth into just about any audio. The problem is that these processes, by their very nature, remove dynamics. In contrast, MPhatik analyses the input level envelope, processes your audio signal, analyses the level envelope of the output and applies a gain to make the output envelope the same as the input. In other words it restores the dynamics. Now you can finally phatten up any audio material without losing dynamics, which is an inevitable result of using any of the classic methods, whether it is digital distortion, analogue saturation, tape . All tools you need to phatten up anything. MPhatik comes equipped with a powerful amp simulator, convolution reverb (featuring all kinds of impulse responses from plate reverbs to halls, rooms etc., or your own IR files of course) and a compressor. If that's not enough, you can also use the side-chain input to drive MPhatik and process the audio with your own tools, leaving MPhatik to restore the dynamics. Apply dynamics of one track onto another one? So how about applying the level envelope from your drums onto a pad to get a rhythmical pad? Or avoiding collisions between drums? Make no mistake, this isn't something you can do with classic tools such as gates or compressors, because these tools use only a single level detector. In other words, they don't care about what audio you are processing. MPhatik does! And its power lets you do it easily.